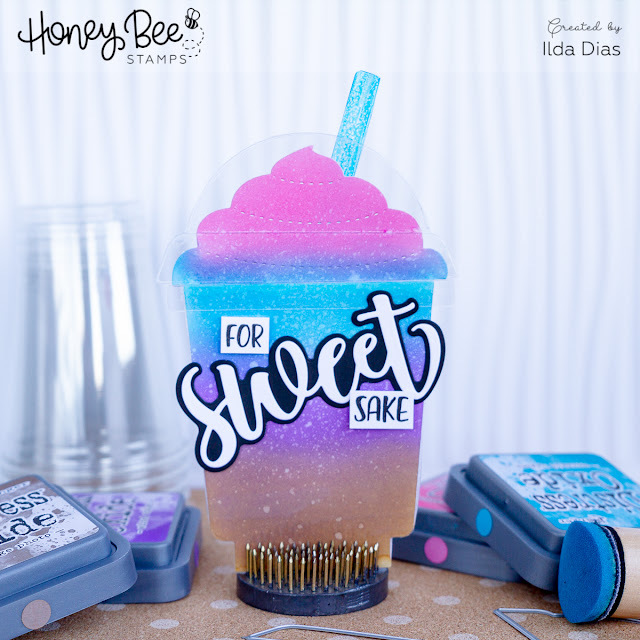 Hope you are enjoying the Sneak Peaks for Honey Bee Stamps BEE BOLD Release! 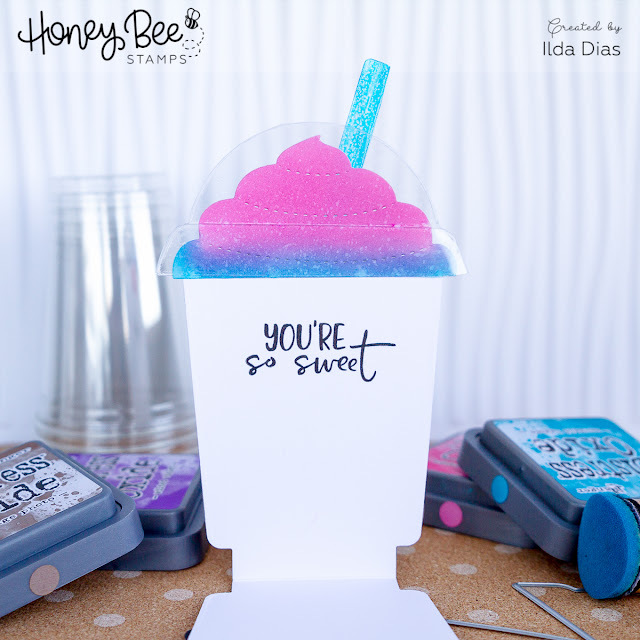 I'm loving all the new goodies and seeing all the amazing inspiration from the DT, it is just so awesome you need to stop by the HBS Blog to check it all out! So today I have 3 Cards to share with you 😃 Three for day 3! My first card uses the new Frappe Shake Dies. Even though this die will most likely be used for coffee geared projects, I instantly thought it reminded me of a Slurpee so that's where my mind went. Maybe it's the Summer heat and it's making me crave a Slushy. I used distress Oxide inks to mix my Slurpee color flavors. I don't know about you all but I never get just one flavor. Since I wanted the card to look like it was in a plastic cup, I used acetate to cover up the entire card base. Sometimes the die wouldn't cut through the acetate but then I just used a pair of scissors to finish the cut. 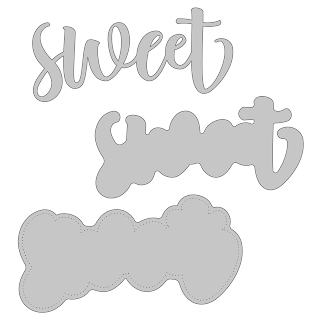 I also used the Sweet Dies on the card front and to finish off the sentiment I added a couple of words from the new Shake it Off Stamp Set. On the inside of the card, I added more sentiments from the Shake It Off set. 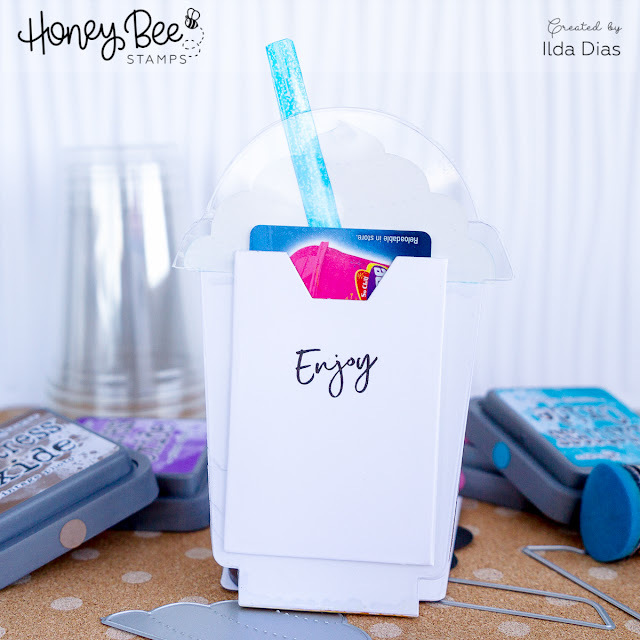 On the back, I attached the new Gift Card Pocket Die, and stamped the word Enjoy. I love how this fun card turned out and think it will make the best treat card for someone. The next few cards feature the new Stacking Heart Dies. I ran the dies with a piece of red and pink cardstock and then glued the hearts alternating the red and pink together. This then gave me two card fronts to work with. For this first heart themed card, I sliced the heart down the center and glued it to the sides of a gate fold card. 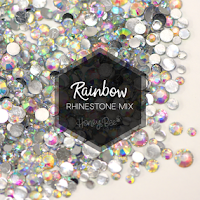 I then used the new Thinking of You Dies to add the sentiment to the front of the heart and finished the front with the Rainbow Rhinestone Mix. To keep the heart folded flat, I added a little mini velcro dot. Here is another view of the Heart Shaped Gatefold card. For this last card, I kept things super simple. Attached the heart to a top folding A2 card front, cut off the sides and then added the Thinking You Dies that I added some glossy accents to. I finished the card front with some sprinkles of Hug Me Candy Hearts. Hope these three cards inspired you today. For more inspiration and to see more Day Three Sneak Peeks stop by the HBS Blog.